Does the possibility of Toronto City Council abandoning the Beautiful City initiative, the 93% cuts to BC culture concurrent with the 2010 Vancouver Olympics, and the coming 2015 Pan Am Games in Toronto mean bad news for Torontoians who value art and culture? The art sector envisioned a Billboard Tax that would reclaim the public visual landscape and allow the public to participate in painting the picture, so to speak. But the community will receive ZERO dollars from the new tax for art programs. The Staff Recommended 2010 Operating Budget simply avoids a general 5% decrease in funding to the arts. Topics like downloading pressure from Provincial government on city services; decreases in funding to other city programs; have risen past the need to allocate revenues from the Billboard Tax directly towards funding for the art sector. Pro-art councillor Gord Perks was a strong supporter of the Billboard Tax and pro dedicating the funds to the arts. Recently, however, an email communication suggests that it’s the general idea of ear-marking dollars which he finds problematic. “I do not support dedicating the tax revenue to a specific program” he stated. Local artists had hoped the City would work to acknowledge the contribution from the arts sector in generating an estimated $10.4-million per year. Old fears are resurfacing as artists see the 90% decrease in funding to arts and culture by the same province that is hosting the world’s premier athletes and start to shudder. Starving artist stereotypes aside, I am quite sure that many essential, arts-service organizations, independent theatre companies and young collectives would make the most out of every penny from these new coffers. With that appreciation, I fear most that a sum like $10.4-million is one that is too easily swallowed up by mega productions of international, amateur sporting events like the Pan Am Games, which are coming to town in 2015. The Toronto arts sector must look west to the role of arts and culture at the Olympic Games and work hard to build on the momentum started by the BCBF and Department of Culture. In British Columbia we can witness high profile Hollywood names with Canadian links in tourism commercials. MTV is broadcasting live performances held nightly at Whistler and Vancouver medal ceremonies. Yet funding to the arts in BC has decreased dramatically in recent years – by 90% last year. Let us also remember that after arts-funding was cut severely at the Federal level in 2008, Prime Minister Harper poured that money into the Olympic Torch Run, which was more evidently sponsored by Coca-Cola than by the Government of Canada, in my opinion. Could Toronto be the next to see culture budget slashing followed by limitless spending on Games preparations? It’s not all down with art and on with brawn. Artists can look forward to opportunities in the Opening Ceremonies and in large scale concert, performance and exhibition series that are to be expected in four years to celebrate the Pan Am Games. Artists play a vital role in interpreting and communicating Canadian values, in making sense of the complexity that is the collective Canadian identity. After this week, we must note that VANOC tapped into our gifts to elevate theirs. However, it is especially important now, to ensure the City of Toronto meets their moral obligation to acknowledge the work by the many individuals who supported the Billboard tax. It is timely to make a positive impact on our industry and to continue the beautification of the cityscape. Rob Ford was the only councillor during the Billboard Tax debate to explicitly suggest the new stream revenue wouldn’t go to culture. It’s also not about artists turning on athletes. My fear is about seeing one sector have its expectations and deadlines met by all means available while the other is perennially tucked behind road work and social programs, despite the dedication shown by the Visual Art sector on the Beautiful City campaign. The Provincial and Federal governments have pledged to support the infrastructure projects required to bring the 2015 Games home. Soon the focus will be diverted towards new housing projects and revitalization of the waterfront, again. Toronto will undoubtedly play the multicultural card in it’s touting of the city around the Western Hemisphere and generating sponsorship opportunities. Sporting events are highly profitable marketing opportunities – in the long run. In the short run, they will cost the City a lot more than $10M per year. Without supporting or protesting the Games, Billboard Tax dollars should be thought of with sights on the future of the industry that made that money available. Artists bring their own fan base, they further increase the hype level of the adrenaline charged environment, and they open new markets. They provide a means to entertain the masses. This is essential for games organizers since the actual sporting events are too expensive or somehow elusive to the local market. Also key for a successful Olympiad is leaving the host city with a sense of pride and some good memories. 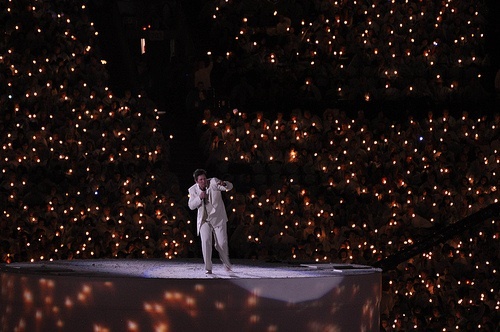 Having volunteered and worked at the Pan Am Games in Winnipeg in 1999, I can point to the Games as the time when I saw Burton Cummings perform live at the Closing ceremonies by request of Manitoba’s Premier, which then led to a Guess Who reunion tour. Personally, I’m not hoping for a Rush reunion. My hope is that given the rise of Hip Hop in Latin America as well as Toronto’s connections to recent success stories; a sensational, summer concert line-up could be expected from July 10 to July 26, 2015. What about the local scene? What about young rappers, slam poets and performers that could be engaged in the dialogue between games attendees and ‘real’ Torontonians? How about continuing to support the budding stars that can one day do their part in promoting the Canadian profile in the world stage? What about nurturing and incubating the masterpieces of the future? Let’s hope that Toronto artists are not asked to bear the burden of the cost of the Pan Am Games. Let’s hope that artists are asked to wear our costumes and stage make-up for 17 days – but not at our own expense – especially after our creative thinking opened a new source of income for the City of Toronto. Adriana Alarcón lives in Toronto. Her art practice includes various fields such as writing, music, design and visual arts. Filed under Adriana Alarcón, arts funding cuts, beautifulcity.ca. Thanks for the clarification/update Devon. It’s good to know there is still positive action that can be taken to secure some of the Billboard Tax revenue for public art. I encourage everyone to follow the link and the instructions on beautifulcity.ca. This seems a no-brainer as only 18% of Torontonians supported it being directed into general revenue!